The US Forestry Service recently created, and published instructions for how Americans should roast marshmallows. They also spent time telling us how to make s’mores. It’s rather insulting, that after all this country has done in its history, we’ve devolved to the point where we need government assistance to figure out how to melt a marshmallow? We used to instinctively know things like this, but now the all intrusive nanny state saved us from ourselves giving us step by step roasting instructions. I have some instructions for the Forestry Service. Find out which office in your department wasted taxpayer money to hire a contractor or pay a government employee to make these instructions up, and cut that funding from your budget. If you have this kind of money just sitting around, you have too much, and after trimming your topline, the American taxpayer would appreciate better use of what’s left! Both Republicans and Democrats heavily quoted the report. Republicans were quick to reference that the report concluded that America can’t sustain the debt path we are currently on. Democrats used a very slight near term improvement to the annual Debt to GDP ratio as great evidence that President Obama and the Democrats in Congress were improving the economy and the US debt picture. As often occurs, the Democrats are stretching the truth to the breaking point. The comparison of spending to GDP, used everywhere in the report, is camouflage for what’s really happening. See a couple of the report’s GDP comparisons by clicking here. Nowhere does the report show the debt in actual dollars. 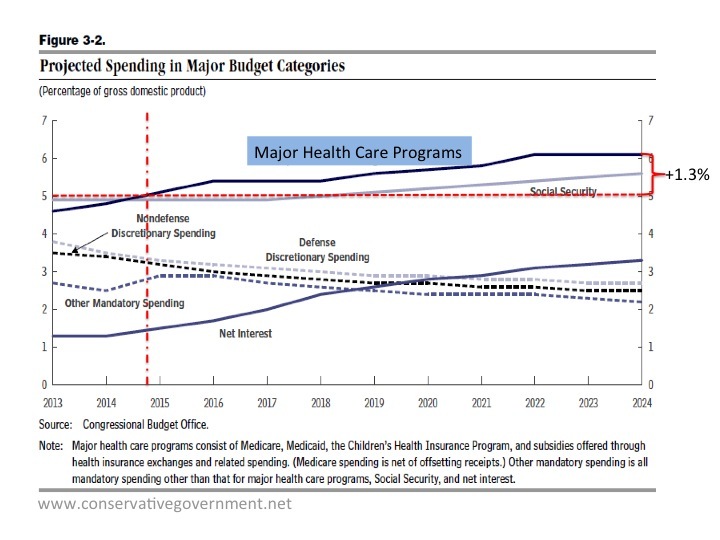 The two charts below expose the truth, extrapolating from the report’s supporting data tables, and proves that fundamentally the US is on a disastrous spending path. Chart 1 below throws the Debt to GDP ratio away and provides raw constant year 2013 dollars for both Total US National Debt and GDP. Democrats trumpet the minuscule dip of the debt (Red Curve) below the GDP (Green Curve) in the 2018 time-frame as great news. Despite the fact that it was caused by the Republican House, it’s so insignificant that you can barely see it. 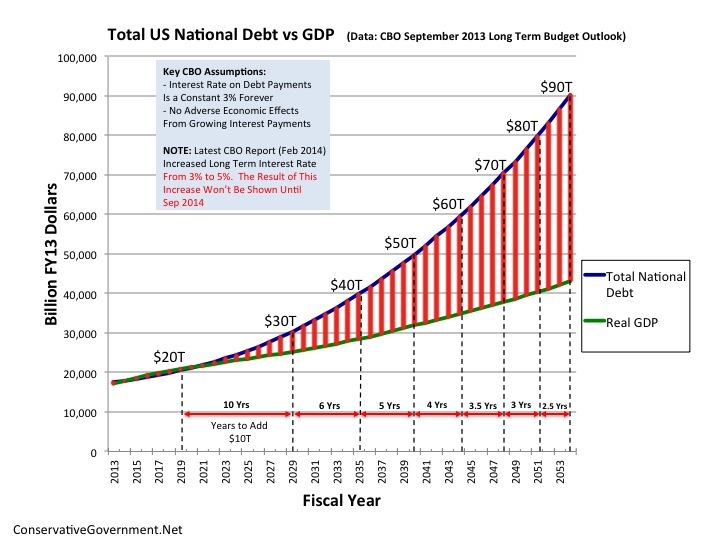 Unless we control the reckless federal spending tidal wave, the red curve (US real debt) will grow exponentially vs our GDP. US debt will pass $30 Trillion by 2030. At some point in the not so distant future, we’ll cross the point of no return, a cataclysmic debt “event horizon”. The responsible answer involves cutting federal spending. 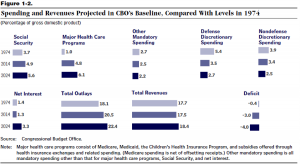 Chart 2 shows two potential futures from CBO’s report. A $2T reduction across ten years reduces the debt growth to the green curve. 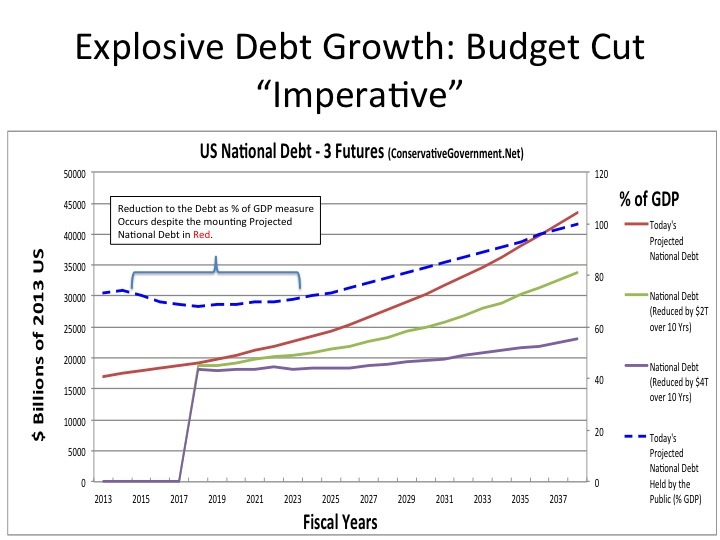 A further reduction to $4T across ten years dramatically (purple curve) cuts the debt’s growth more, but it does not yet cut the debt. Additional reductions (beyond $400B/yr), along with pro-growth economic policies are critical to balancing, and perhaps dare I say, paying it off. 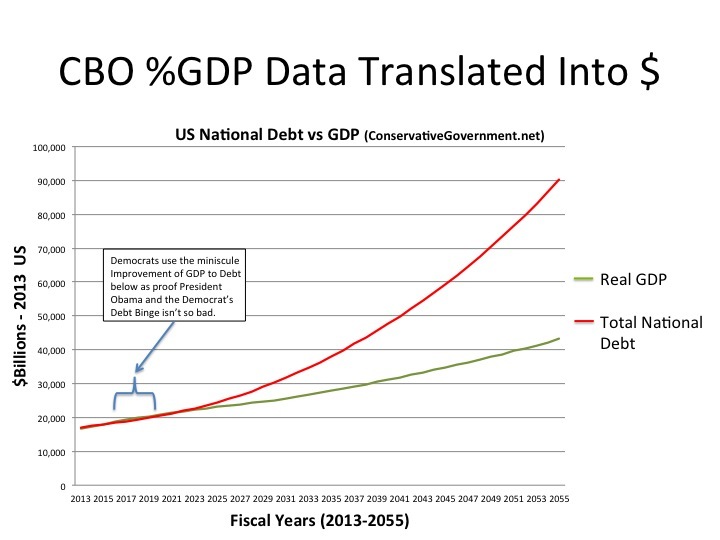 For comparison purposes, the Debt to GDP ratio was added to Chart 2 (dotted blue line). Notice that the Democrat’s touted reduction in Debt to GDP clearly happens at the same time that the Debt itself explodes. BOTTOM LINE: Significant cuts are essential and need to happen yesterday. NOTE: Comparisons to GDP are useful to assess one time in history to another. However, our goliath government created a new paradigm that makes the debt to GDP ratio a poor future comparison and pundit “feel good” conclusions based upon them grossly misleading. Why? 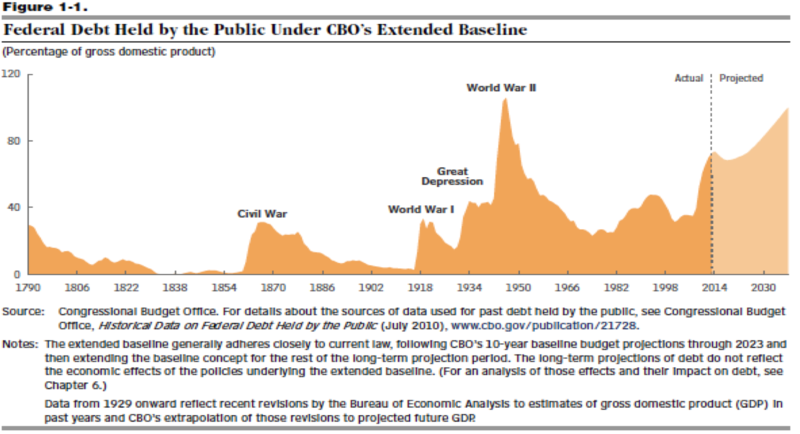 Huge spikes in past Annual Debt to GDP were largely due to military wartime spending, easily reduced after wars ended to return to sustainable spending. See below chart. 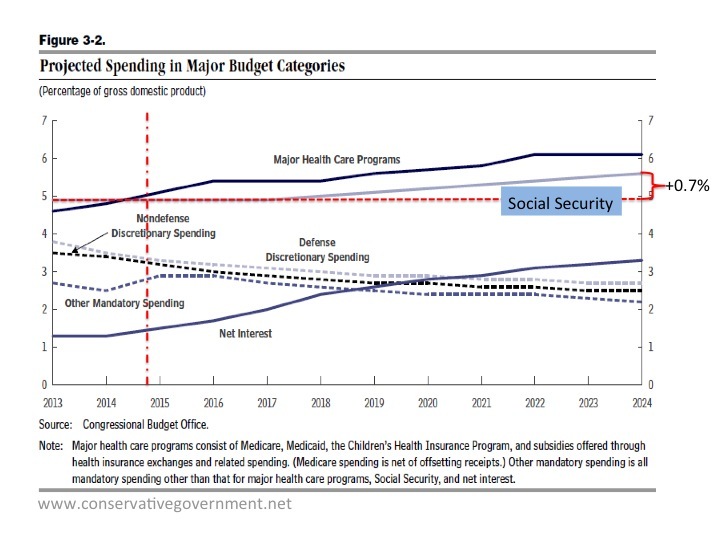 Today’s spending, which drives each year’s budget deficit, is increasingly caused by sources that can’t be easily eliminated (unlike the case with wartime spending). Interest on the national debt. The interest avalanche grows each year, as shown here, and must be paid or the US Government defaults on its obligations. Even Progressives admit that’s a bad thing. Social welfare programs are the third rail of politics. Democrats use them to buy votes, and bludgeon anybody who suggests responsibly reforming them. 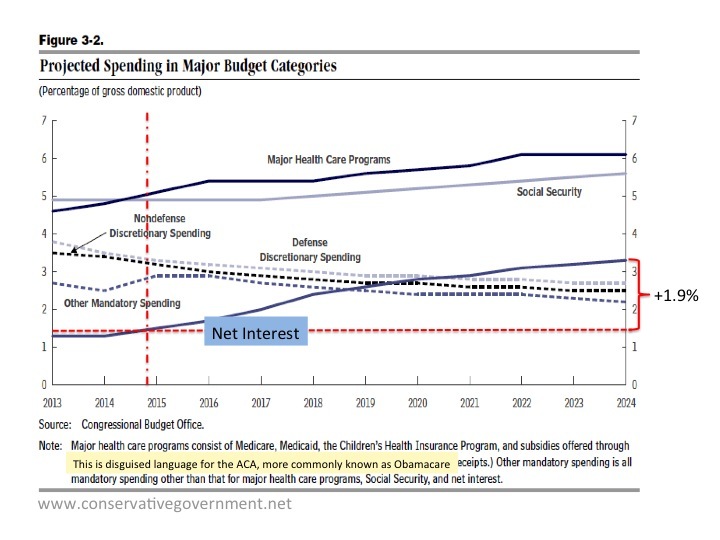 Interest and social welfare programs, which now include Obama Care’s massive costs, will consume the budget, pushing all else aside. That “all else” includes what our Constitution mandates the Federal Government actually do. US Federal spending over the last ten years went through a dramatic shift from borrowing around $140B/year to consistently borrowing over $1T/yr (or a nearly a ten fold increase). How did this happen? 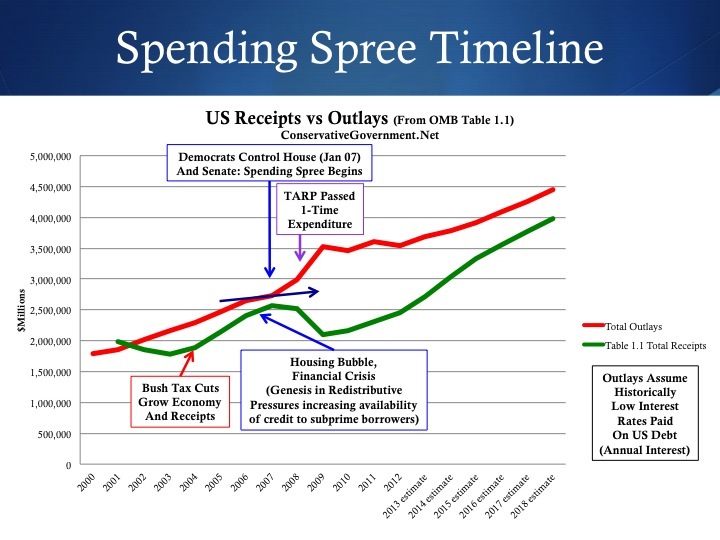 The following three charts cast light on that spending spree timeline. Each chart shows total Federal Outlays (or spending) in red, and total Federal Receipts (money coming in through taxes) in green. 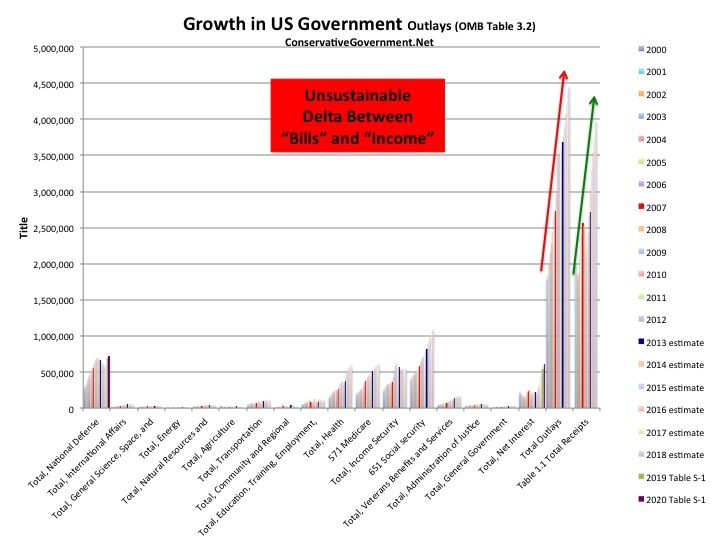 The gap between the lower green line and the upper red line is the money borrowed by our government to pay its bills. Long-range OMB projections, going out beyond 2050 never forecast those two lines to cross. Said another way, we will drown in debt unless we change course and balance our budgets. Chart 1 highlights a few key points during the Bush administration. President Bush cut taxes early on. Despite an initial decline in federal revenue, as is the case every time that it’s tried, revenue grew rapidly and was closing on federal spending, despite the added cost of the Global War on Terrorism. Democrats took over the House of Representatives and Senate in January 2009, electing Nancy Pelosi Speaker and Harry Reid Majority Leader. Spending began to accelerate as soon as they took control. At the end of the Bush Administration, the housing bubble (created by Progressive/Liberal Social Wealth Redistribution Mortgage Policies started in the Carter Administration) burst and brought on nearly $450B in TARP spending (then Senator Obama voted for it). Chart 2 highlights a few key points in President Obama’s first term. Democrats expanded their majority in the Senate, and kept Senator Reid as the majority leader. President Obama was sworn in Jan 09, and passed his stimulus in February 09. 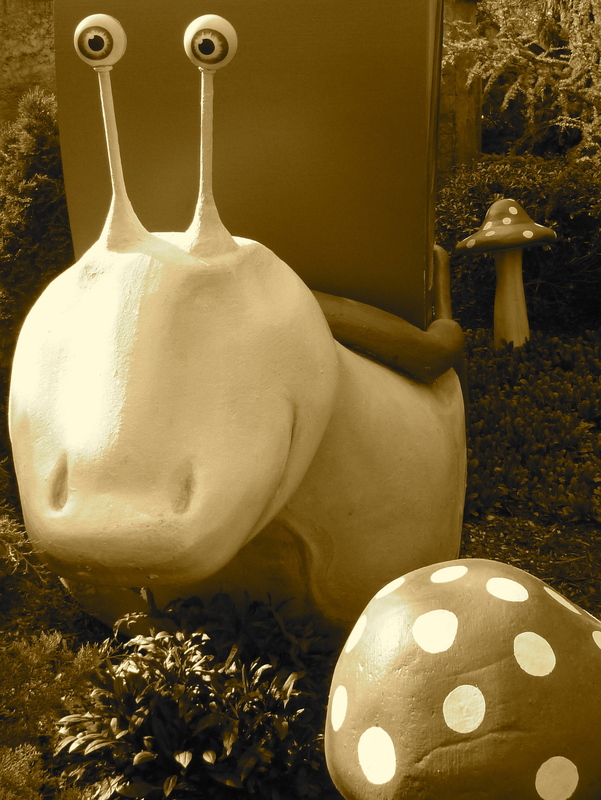 The last budget until fall of 2013 was passed in April 09. After the April 09 budget, continuing resolutions were used to fund the government. These CRs basically acted like copies of the April 09 spending. The stimulus, which had massively raised spending and was supposed to be a one time deal, got perpetuated every year through the CR process. Could that be the reason why Senator Reid refused to pass budgets each year? Chart 3 highlights a few additional key points. 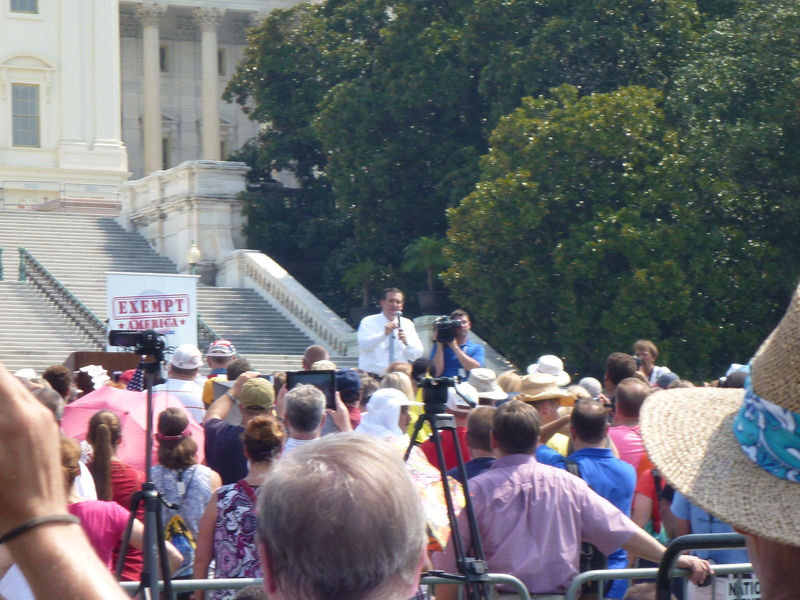 The GOP regained the House majority, in a massive 2010 mid-term election. Republicans, with control of the House and with Speaker Boehner taking the gavel from Congresswoman Pelosi, were able to stop the rapid growth in federal spending. 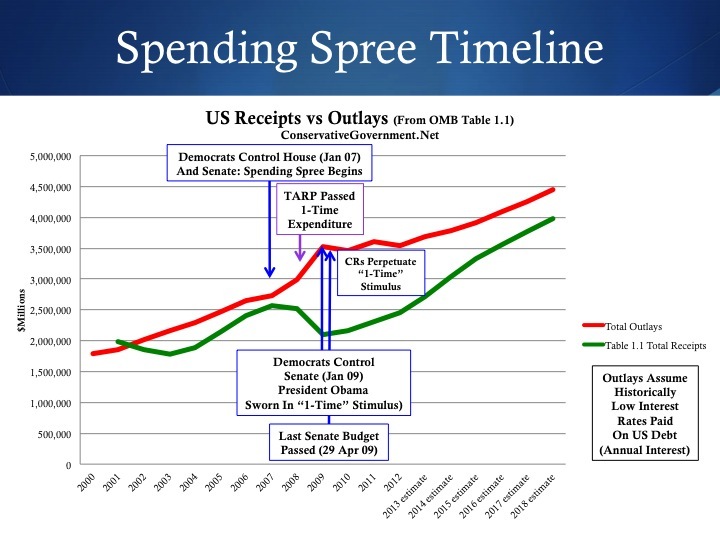 The growth in spending from 2007 to 2010 was now “baked” into the federal baseline, and repeated through CRs. Federal spending exceeds receipts forever. 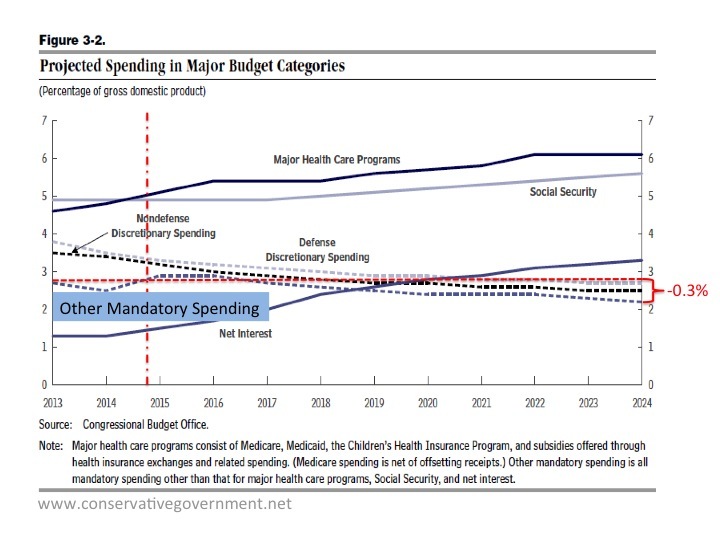 A good place to start in reducing the spending requires going back to 2007 spending levels in every department. Find the “one-time” funds and cut them out of the federal base budget. Where is our money going when the federal government spends it? Chart1 below, taken from OMB data, shows the all outlays, or spending buckets, as defined by the office of manpower and budget. Chart1 is organized from fiscal year 2000 out to fiscal year 2018. FY 2000 through 2012 data is actual budget data while FY13 through FY18 data is forecast. The important thing to note in this table is the red and green arrows. 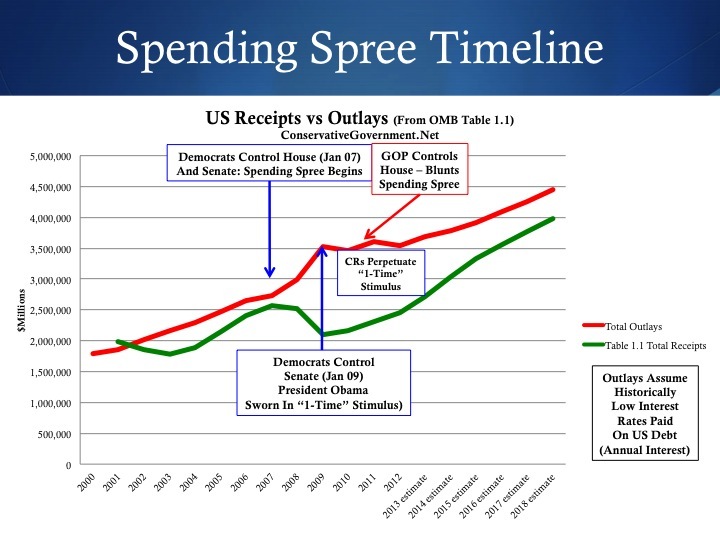 The red portion of the arrows shows the trend of upward spending and growth in spending where as the green portion of the arrows show a decline or leveling in spending. 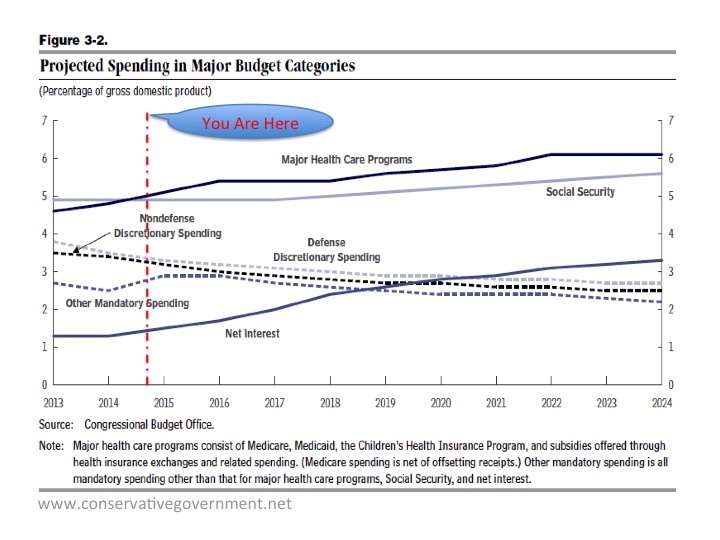 Unfortunately our federal government’s spending is out of control, as clearly shown by the red arrows and the steepness of those arrows. There are very few green ones. 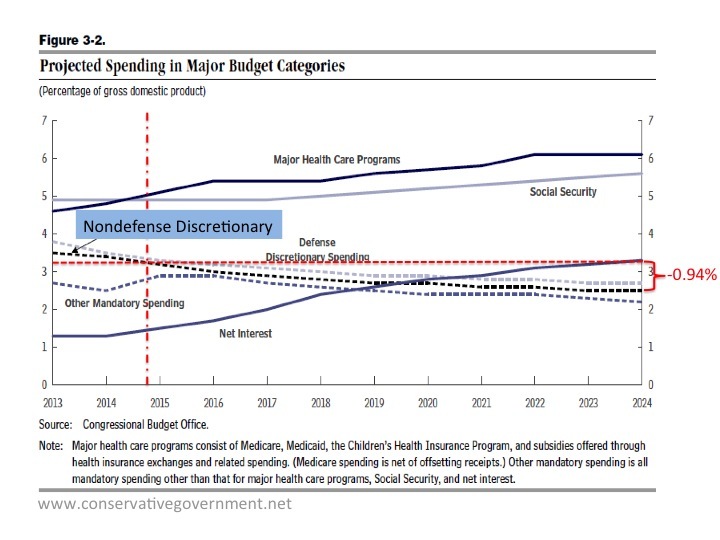 Downward movement, with the exception of the Department of Defense, which took roughly an 18% decrease in two major cuts, is the exception to the high spending rule. The first cut happened under Sec. Gates when he reduced the Department of Defense budget buy $483 billion over 10 years. 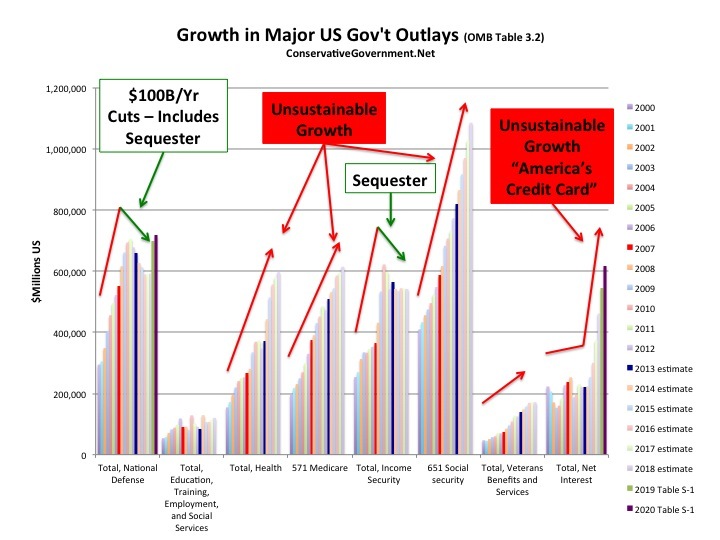 The second cut, a result of sequestration, equals nearly $500 billion over 10 years. 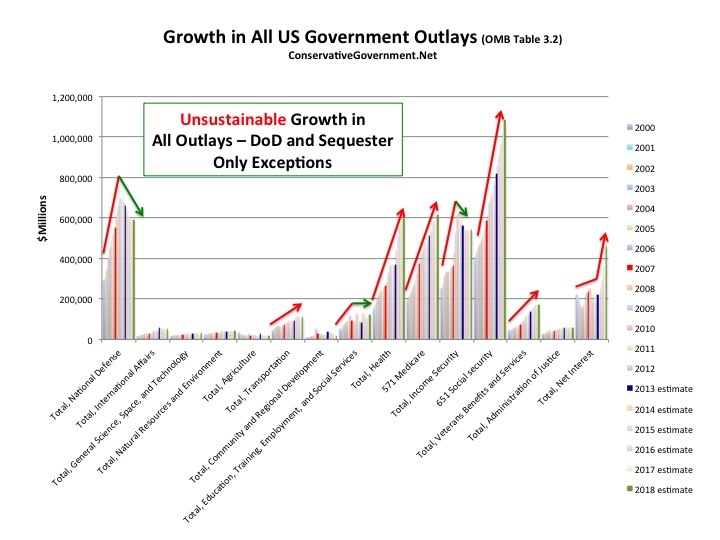 The other buckets that you see with green arrows were also caused by sequestration. Notice that the red arrows’ upward vectors are significantly greater than the leveling in the few buckets that the government reduced. It’s also important to notice the increasing vector in the far right bucket, which is interest on the federal debt. The president of the United States and the Democrats in Congress continue to rack up nearly $1 trillion more in debt, in the names of our children every year, and they have no plan to ever balance our nation’s budget. The only slow down to the relentless spending spree was caused by the Republican Party attempting to arrest the disaster that reckless spending most certainly leads to. Chart 2 is a blowup of the major outlay buckets shown in Chart 1. Chart 2 also adds fiscal year’s 19 and 20 to the total national defense in total net interest buckets. The increase in the total net interest is very likely optimistic, as it is based on a historically low 3% interest rate. 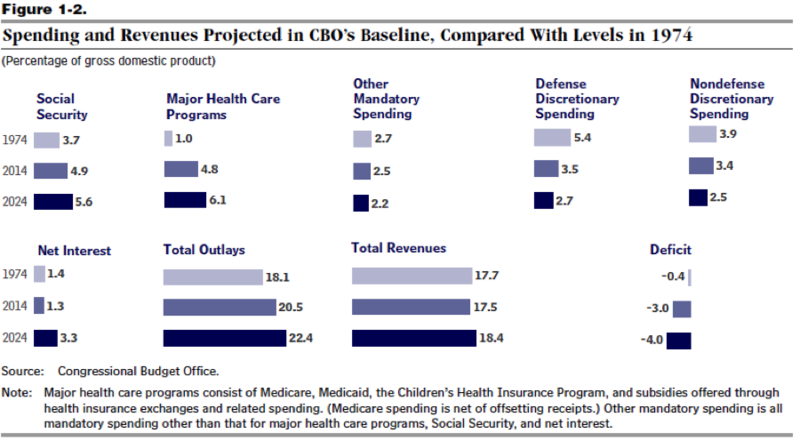 Fiscal Years 19 and 20, in the total national defense bucket, are likely excessive given that OMB calculated them before the impact of sequestration. 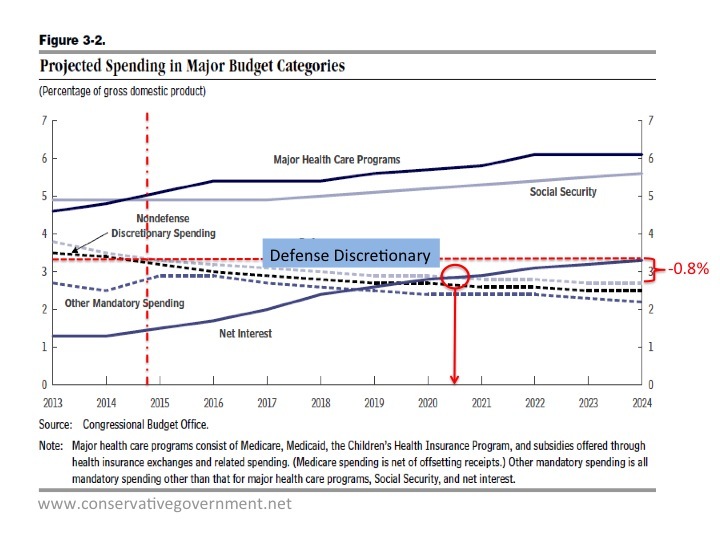 What this chart shows is that soon after FY20, interest on the national debt will exceed the entire national defense budget. Interest on the debt is like interest being paid on a credit card. It comes back month after month eating up the family budget. There’s no option but to pay it or go bankrupt. Paying that much in interest every year in your personal budget means there is far less money left to pay for groceries, the mortgage, or save for the future. The same is true for our nation as the magnitude of this interest bill will soon eat over $1 trillion a year! Chart 3 adds two more columns to Chart 1. Total receipts (taken from OMB table 1.1), which is essentially all the taxes collected by our government. These two buckets look like massive skyscrapers, but the total outlays bucket is much taller. The difference between these two “skyscrapers” becomes debt piled upon the backs of the American people. The red arrow exceeds the green and the two never meet. This is an unsustainable, reckless, and eventually disastrous path created by both parties, but vastly accelerated by Nancy Pelosi, Harry Reid, Democrats in the House and Senate, and Pres. Obama. The only responsible policy is to balance this budget, and it’s clear that the people who accelerated it are completely incapable of helping to fix the problem. They must be thrown out of office, marginalized if they can’t be replaced, and gone around to save our Nation’s future.